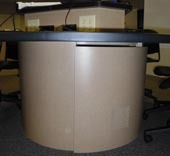 SCALE-UP specifies round tables seven feet in diameter. Despite the widespread adoption of SCALE-UP, most furniture manufacturers have not yet made this a standard table size. When NMU put out a request for furniture bids, all of the responding vendors proposed custom-built tables. NMU selected student tables and a matching instructor station designed and manufactured by Wynn O. Jones & Associates of Schofield, Wisconsin. 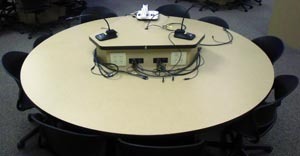 Notably, the Wynn Jones table, unlike the others proposed, is supported by a single large pedastal. This allows students to sit—and move—around the table without being encumbered by table legs. The pedastal also houses electrical cables and electronics that enable video switching. These items are accessed through a removable panel. 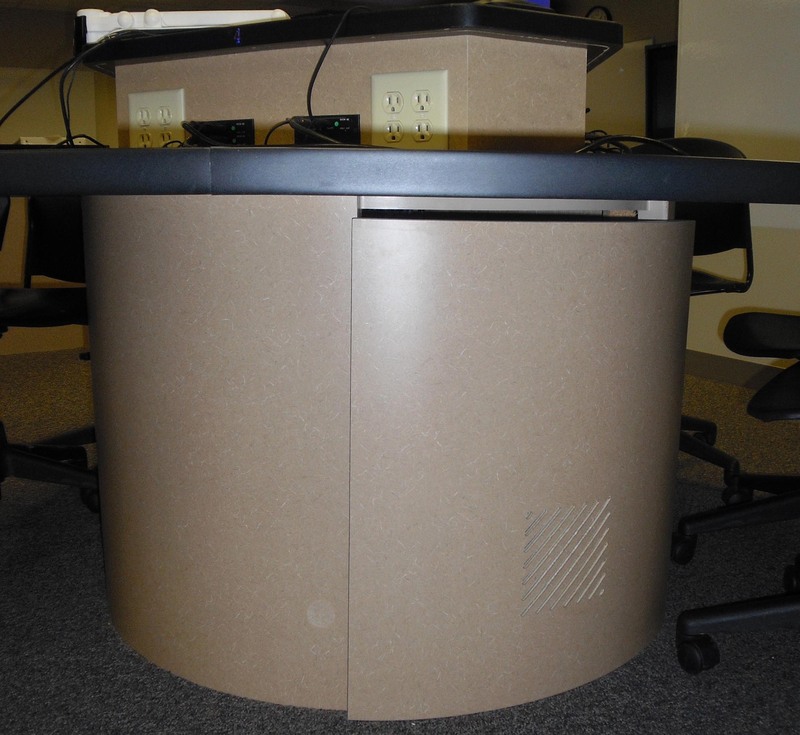 Wynn Jones worked closely with NMU's electronics engineer on the design of an attached triangular tabletop unit that houses electrical outlets and the switches that select which student's laptop is displayed on the table's monitor. SCALE-UP recommends that the instructor station be placed relatively in the center of the classroom so that the room does not have a traditional "front," but unlike with the student tables there is no specific "SCALE-UP size" for instructor furniture. 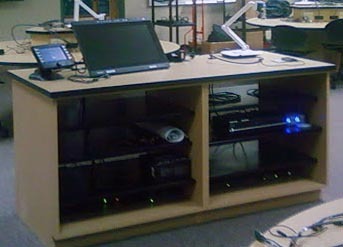 NMU calculated the size specifications for the instructor station upon the surface area needed for instructor controls and teaching tools, shelf space needed for electronics (e.g., amplifier, video switcher), and floor space available in the room configuration. Several vendors responded with instructor stations that met the specifications, and the differences among them were more minor than with the proposed student tables. The Wynn Jones design was selected, as it matched the student tables and was competively priced. 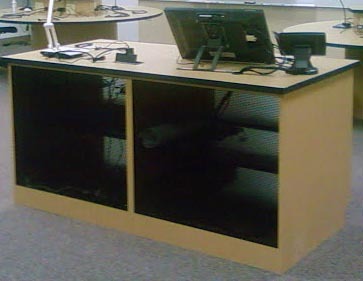 The instructor station measures 74 inches wide by 36 inches deep and is 36 inches high. The cabinet area is divided in half, with each half having four shelves, three of which are adjustable. 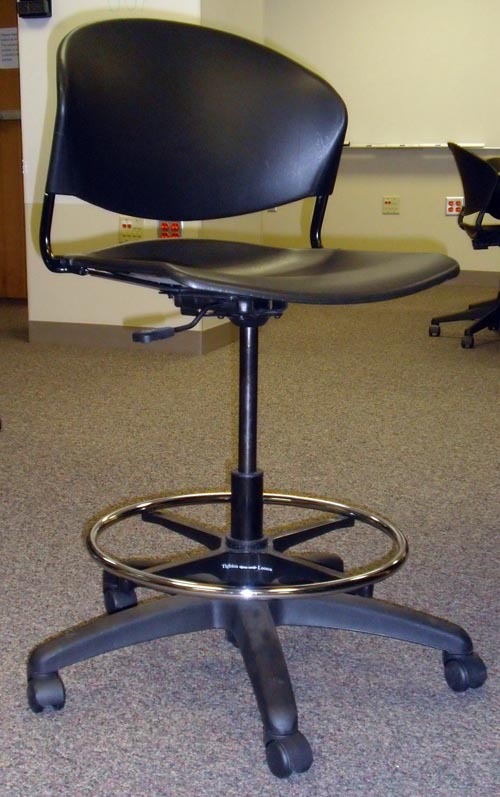 SCALE-UP recommends chairs on castors, so that students can move around easily during collaborative activities. NMU specified. 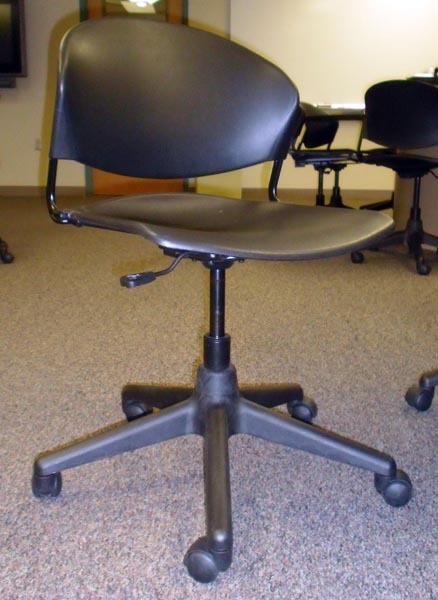 NMU requested bids for adjustable height, unupholstered chairs without arms. Several vendors bid similarly priced chairs, and NMU obtained evaluation units for the top contenders. After receiving opinions from several students and faculty members, the project team selected a model produced by Trendway. The instructor stool, which has the same body as the student chair but a taller pedastal.